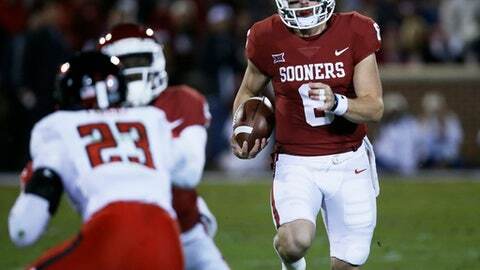 NORMAN, Okla. (AP) Oklahoma quarterback Baker Mayfield seems to step up as the stakes get higher. The senior quarterback has a 9-1 record after the start of November in his career at Oklahoma, with the only loss coming in a national semifinal against Clemson in 2015. Included in the wins are two victories over Oklahoma State that clinched Big 12 titles and a Sugar Bowl win over Auburn. Mayfield will have another opportunity to add to his reputation Saturday when the eighth-ranked Sooners visit No. 11 Oklahoma State. The winner will remain at the top of the Big 12 standings and greatly increase its chances of reaching the Big 12 championship game. Of Mayfield’s 10 games after the start of November at Oklahoma, eight have been against ranked teams. In those eight games, he has completed 66 percent of his passes with 17 touchdowns and five interceptions. He also has five rushing scores in those contests. Even when Clemson beat the Sooners in 2015, Mayfield passed for 311 yards and completed 63 percent of his throws. In his one statistically poor game of the bunch, he left the game against TCU in 2015 at halftime with a concussion. He had put the Sooners in good position before leaving, and Oklahoma still won. Mayfield said there’s no significant change in his approach, or his team’s approach, to late-season games. He does acknowledge that the team takes pride in its reputation for finishing strong. Mayfield has been especially effective against Oklahoma State. Two years ago, he passed for 180 yards and two touchdowns and ran for 77 yards and another score in Oklahoma’s 58-23 win the game after his concussion . Last year, he passed for 288 yards and threw two of his three touchdown passes after eventual Biletnikoff winner Dede Westbrook was knocked out of the game in the second quarter of a 38-20 victory . Mayfield has acknowledged over the years that a strong running game has contributed greatly to his late-season success. The past two years, Samaje Perine and Joe Mixon combined to take pressure off him. This season, Rodney Anderson, Trey Sermon and Abdul Adams all have more than 400 yards rushing and appear capable of providing a similar lift.